Ever since I have been immersed with the Filipino deaf community, the signs of the words “Cavinti, Laguna“, DEAF, Ma’am Coryell and Happee Toothpaste always crop up. The deaf will most likely sign to me, “I’ve met that deaf girl from Laguna.” as if the entire province is populated by deaf people. That is precisely because of the impact made by my forever idol, the 88-year old Ma’am Aimee Ada Coryell and her wonderful quest to teach the Filipino deaf about God’s Word while at the same time put shelter on their community. I am so proud that I know her personally. I always love to listen to her stories and admired her positive impact to me and the Filipino deaf community. MANILA, Philippines — Two years ago, in May, 2009, to be exact, I wrote about Happy Hearts in Sierra Madre – a true story about people with happy hearts living in a community located near Barangay Paowin, Cavinti, Laguna, along the boundary of Quezon and Laguna provinces – and within the mountain range of Sierra Madre. To reach the elevated community located in Sierra Madre (2,000 feet above the Caliraya Lake) from the nearest passable road in the highway, one must walk seven and a half (7 ½) kilometers for 1 ½ to 2 hours, depending on how brisk one walks. This community I am referring to is none other than that founded, established, and operated by the Deaf Evangelistic Alliance Foundation, Inc. (DEAF, Inc.), a non-profit organization that focuses on the education of hearing-impaired Filipinos. 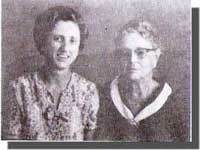 Fifty years ago, or in 1961, a mother-daughter American missionary team (the late Ada Mable Corryell and her daughter Aimee Ada Coryell, now 88 years old, staying in the Philippines and still serving the Lord through DEAF, Inc.) arrived from Japan and saw the urgent need in our country to help our hearing-impaired Filipinos and to share with them the Gospel. And so DEAF, Inc. was organized and registered as a non-profit organization in 1969 to formally educate the Filipino deaf. DEAF, Inc., after 42 years of God’s grace still exists. Today, a community of 278, Happy Hearts thrives in Sierra Madre. The 254 students (from elementary to college) and 24 teachers and support staff have through all these years been surviving without the luxury of regular electric power (a generator provides light only from 6 to 10 p.m. every day since 1990). Feeding 278 people with no kitchen appliances like freezers, refrigerators, rice cookers, and electric or gas stoves may be an impossible task to many of us who are used to enjoying the convenience of electric power. This is not the case with the happy hearts in Sierra Madre who use firewood to cook their food. 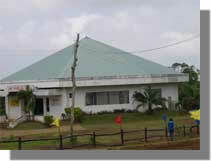 After 22 years of having no electricity, DEAF in Sierra Madre will soon have its electricity by May, 2012. 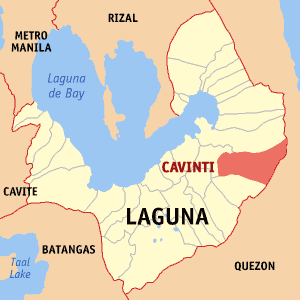 The lady mayor and other local officials of Cavinti are instrumental for this project. While DEAF’s marketing is done twice a week to the distant town of Sta. Cruz, Laguna, a 4-by-4 tractor is used to transport the groceries/food stuff from the highway in Sta. Cruz, Laguna up to the campus-community in Sierra Madre. 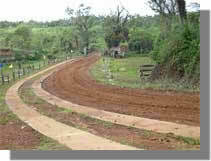 Only a tractor can go through the 7.5-kilometer muddy road connecting the campus-community to the nearest highway. And by the way, since there is no freezer, the spoilable food like meat have to be eaten on the day they are purchased. “DEAF, Inc., survives mainly on love offerings,” says DEAF Director Slavador “Badong” Cuare, who has been with DEAF, Inc., for 29 years. His wife Helen, DEAF’s guidance counselor, has been with the school for 21 years. 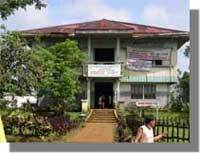 All their three grown-up children finished their college in Cavinti, Sierra Madre. The unique feature of this school is that the teachers are equipped to be missionaries to share the Gospel whenever they go to the lowlands. More specifically, the teachers have special training in Bible subjects and in evangelism. This holiday season, let’s share our blessings with the happy hearts in Sierra Madre. One may wonder what is the secret of the happy hearts in Sierra Madre. It’s simply the close personal relationships of the teachers, students, and support staff with our Lord God. Every day, at 7-8 a.m., the students have their devotional service. I know this for a fact because I have two grown-up boys under my care now 19 and 20 years old named Timothy and Stephen (who were left at the main door of our old house in Naga when they were about three months old) who are studying in the DEAF (2nd year and 3rd year college, education) school in Cavinti, Sierra Madre. They are both well-trained in the Bible, like all the other students, teachers, and support staff of DEAF, Inc.
Visit the DEAF website which our deaf student created.